If you are planning on traveling around Kyoto to the fullest during your trip, we recommend you purchase convenient and money-saving day passes. Because these tickets are sold by various companies that control different sections of the Kyoto train, subway, and bus network there is unfortunately no “universal pass” that covers everything, but using the following information you can choose the pass that best suits your needs. This pass can be used on all Kyoto Subway lines and City Bus lines, as well as on Kyoto Bus (with some exceptions) and Keihan Bus (with some exceptions). It gives you an unlimited number of rides on these networks for either one or two consecutive days, and may be the best choice if you are planning to spend most of your time in Kyoto city proper. You can also get special offers at some tourist spots if you present this ticket on the day of use. On the bus: insert your pass into the card slot of the machine located next to the driver before exiting the bus on your first ride. The date will be printed on the back of the card, so you can just show the date on your pass to the driver when exiting the bus for all rides after that until your pass expires. On the subway: insert your pass into the turnstile slot and proceed through the gate, but don’t forget to take your card after you pass through. The date will be printed on the back of the card when you go through the ticket gate for the first time. 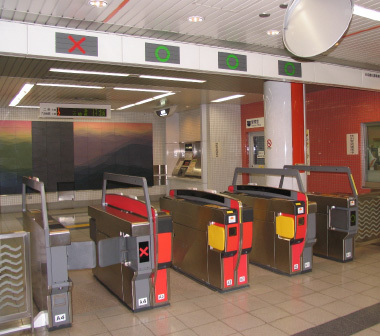 When you arrive at your destination, insert the pass into the turnstile slot to exit, once again taking care not to leave the pass behind. You can buy the Kyoto Subway & Bus Pass at any subway station in Kyoto, at commuter pass sales booths, at the Kyoto City Bus & Subway Information Center, or at the Kyoto City Bus Management Center. The Hankyū Tourist Pass gives you unlimited access to the Hankyū rail network that connects the cities of Kyoto, Osaka, and Kobe. If you want to explore all of these cities in a short space of time, the Hankyū Tourist Pass is a good choice (though please note that the Kobe Kōsoku Line is not covered by this pass). This pass is only available to foreign tourists visiting Japan for sightseeing with “temporary visitor” visa status, and you will have to present your passport at the time of purchase. The 2-day pass may be used on non-consecutive days within its period of validity. When you purchase this pass, you will receive a booklet with special promotions for the Hankyū Tourist Pass holders. If you have any enquiries, please contact one of the Hankyū Tourist Centers. The Kansai Thru Pass gives unlimited access to most non-JR railway, subway, and bus networks in the Kansai area, making it very convenient for those who want to explore the entire Kansai region: Kyoto, Osaka, Kobe, Nara, and Wakayama. It is essentially the opposite of the Japan Rail Pass, and is also only available to foreign tourists visiting Japan for sightseeing with “temporary visitor” status. The Kansai Thru Pass comes as a 2-day or 3-day type and can be used on non-consecutive days within its period of validity. When you purchase this pass, you will receive a free area map showing where the pass can be used and a set of coupons. Holders of the Kansai Thru Pass are also eligible for special promotions at many tourist sites. The Kansai Thru Pass can be purchased at a travel agency before your visit, or after you arrive in Japan at the Tourist Information Center at Kansai International Airport or the Kyoto Station Bus Information Center. (For other locations, please visit the official website.) You will have to present your passport and fill out an application form at the time of purchase.